North Main Music Blog: We're holding a "Summer Sizzle" Festival on July 20! We're holding a "Summer Sizzle" Festival on July 20! We're psyched to announce that we'll be hosting a “Summer Sizzle” event on Sunday, July 20, from 12 to 4 PM, at our Nashua location parking lot, 28 Charron Avenue. 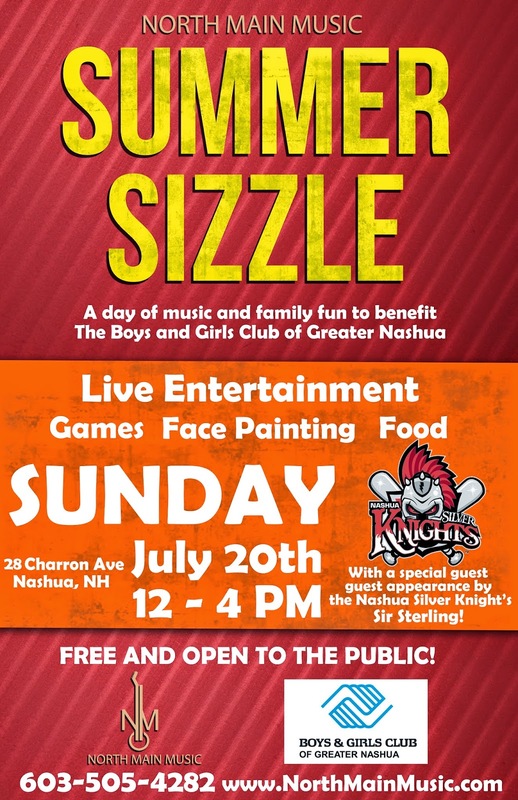 Summer Sizzle will feature live entertainment, face painting, bounce house, food, and a raffle with many must-have items, the proceeds of which will benefit the Boys & Girls Club of Greater Nashua. Live music will be provided by North Main Music’s student bands, some of whom are veterans of the Nashua area live music scene, having already performed at the Winter Holiday Stroll and Rock’n Ribfest, and the Boys & Girls Club chorus. The Nashua Silver Knights’ Sir Sterling will also be making a special guest appearance that day. Raffle items will be announced the day of the event and all proceeds will benefit the Boys & Girls Club of Greater Nashua, whose mission is to enable all young people, especially those who need them most, to reach their potential as productive, caring, responsible citizens. Summer Sizzle is free and open to the public, so spread the word to friends and family! It is an outdoor event that will take place rain or shine. For more information about Summer Sizzle call us at 603-505-4282. For more information about the Boys & Girls Club please call 603-883-0523 or visit www.bgcn.com.